The 7th edition of the International Intellectual Property Index, “Inspiring Tomorrow” was released by the Global Innovation Policy Center (GIPC) of U.S. Chamber of Commerce on 8 February 2019. The IIP Index 2019 was topped by the United States with 42.66 points out of 45, followed by the United Kingdom (42.22) at 2nd, Sweden (41.03) at 3rd and Germany (41.00) at 4th. 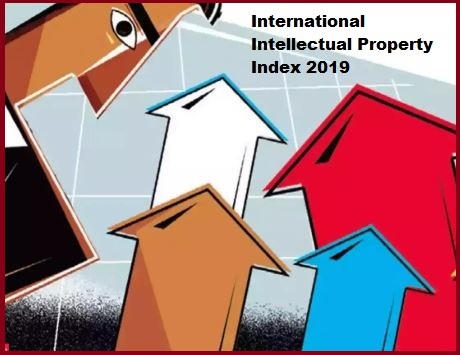 India jumped eight places in the 2019 International Intellectual Property (IP) Index, ranking at 36th position among 50 countries. India’s overall score has increased from 30.07 percent in 2018 to 36.04 percent in 2019. This jump in the ranking is attributed to the recognition of international standards of copyright protection and incentives for intellectual property. The report notes that the improvement reflects important reforms implemented by Indian policymakers towards building and sustaining an innovation ecosystem for domestic entrepreneurs and foreign investors alike. India’s overall score has also increased substantially from 30.07% (12.03 out of 40) in the 2018 index to 36.04% (16.22 out of 45) in 2019. India’s score represents the largest gain of any country measured on the Index.